Are Hawthorne Dental Implants Right for You? If you have missing teeth, or if you’re faced with tooth loss due to gum disease or damage to your teeth, you have many options available to help keep your smile looking and functioning at its best. Removable partial and full dentures and fixed bridges are common restorative solutions for tooth loss, but each option does have drawbacks. More and more people are turning to dental implants as an alternative to these types of prosthetic appliances, and Reddy Dental Group of Hawthorne can help you determine if they are the right solution for you. Dental implants are used to replace teeth that have been lost or badly damaged. 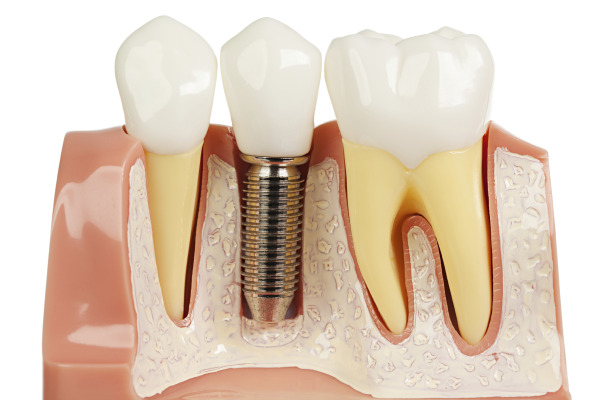 Placing implants involves inserting an artificial root into the gums and jaw. Usually made of titanium, the root becomes fused to the jaw through a process called osseointegration after the procedure and remains permanently in place. With traditional dental implants, a permanent crown is attached to the root after the site around the post has healed. Tooth loss can pose many problems. In addition to the aesthetic effects, gaps in the teeth can change the alignment of the jaw and other healthy teeth. Over time, this can lead to severe pain that makes it difficult to open your mouth mouth and chew. Even if you do not develop severe misalignment, you may find it more difficult to enjoy the foods you love with missing or badly damaged teeth. Many people believe that dental implants are too expensive to be viable solutions to their dental concerns. At Reddy Dental Group, however, we specialize in affordable dental implants in Hawthorne that suit our patients' budgets. One of the most affordable methods of treatment is the implant-supported denture. Here, implants are used to stabilize a partial or full denture, eliminating problems associated with poor fit. The placement is far less expensive than traditional implants and leads to an improvement in jaw alignment and the appearance of your smile. What Should I Look for in an Implant Dentistry Practice? Any implant dentistry practice should begin treatment planning with a full examination of your teeth and gums. Dr. Reddy always examines patients thoroughly in order to spot any barriers to successful placement, such as underlying gum disease. The focus at Reddy Dental Group is to provide the most appropriate implant option for every patient, so we work hard to match needs with the procedure that has the best chance of looking natural, functioning well and lasting for years to come. Will I Benefit from Dental Implants? Dental implants can be beneficial for almost anyone with tooth loss or broken, damaged or diseased teeth. To find out more about what dental implant option is the best for your needs, schedule a consultation with Dr. Reddy by calling Reddy Dental Group today.